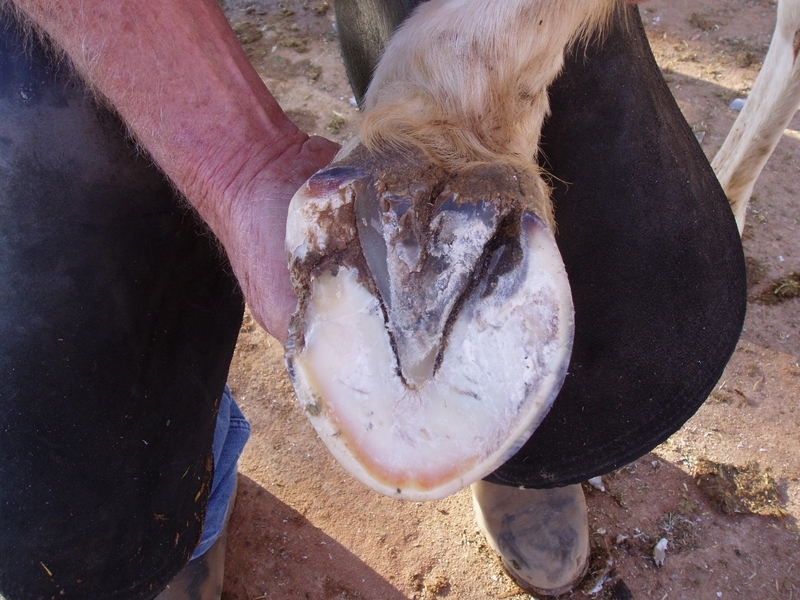 The failure to understand and address this area in hoof maintenance programmes for many decades has led to a multitude of ongoing lameness problems, and has been the catalyst for so many bad trimming and shoeing outcomes for too many farriers and hoof carers. Just for the exercise, go and have a look in that pile of old horse shoes behind the shed, you will find some of the most amazing shapes and creations, all man made alterations to cater to the distorted hoof shapes. 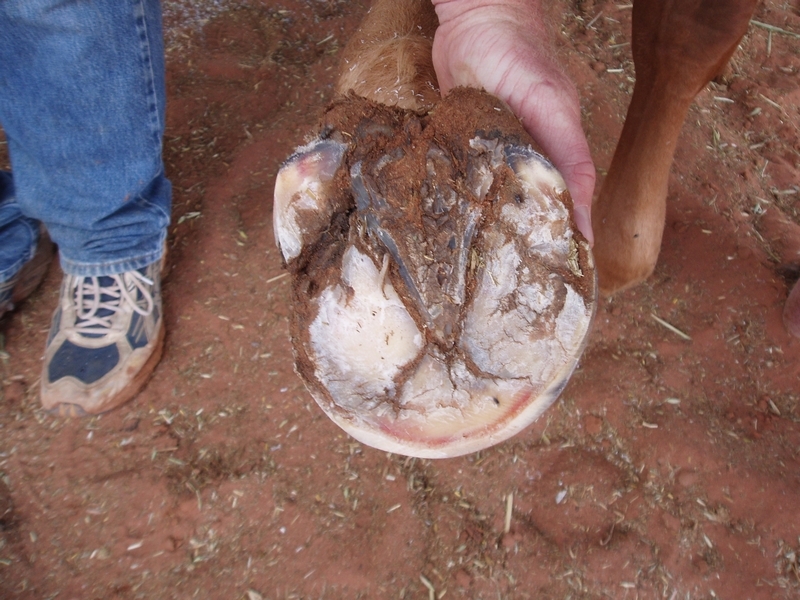 Less than one percent of horses’ hooves have genuine hoof deformities and these are the result of accidents causing damage to the coronary band which results in permanent distortion to the new growth area and hoof wall shape. Lack of understanding of what is the normal hoof shape is the biggest problem. If we can just look at the hair line shape of the coronary band and realise that the bottom or ground surface of the hoof should be the same shape then it will help when trimming to reduce the flaring. Remember that the hoof wall is actually millions of tiny hair fibres bonded together. While these fibres are straight they are strong, but if they are allowed to grow too long they bend and begin to form into a flare; then they become weak and lose their ability to bear weight correctly. Often in a white foot you will notice redness (bruising) where the side walls begin to flare; this is not actual bruising, it is sub-surface bleeding caused by the hoof wall tearing away from the sensitive laminae which bonds that hoof wall to the pedal bone. It is also causing great pain in the hoof, yet because we haven’t understood this, we then beat the heck out of a shoe to make it fit this odd shaped hoof, then expect the poor horse to work all sorts of miracles and faithfully carry his rider and endure the pain. When you consider that the horseshoe manufacturers have spent millions of dollars to create a user-friendly horseshoe that mirrors the image of the coronary band, then surely we should ask ourselves why we need to alter it so radically. When we look at the mess we have created, it is little wonder that all the alternatives to traditional shoeing have come to the surface in the last decade or so. However these are only inadequate band aids and don’t address the real cause of lameness. 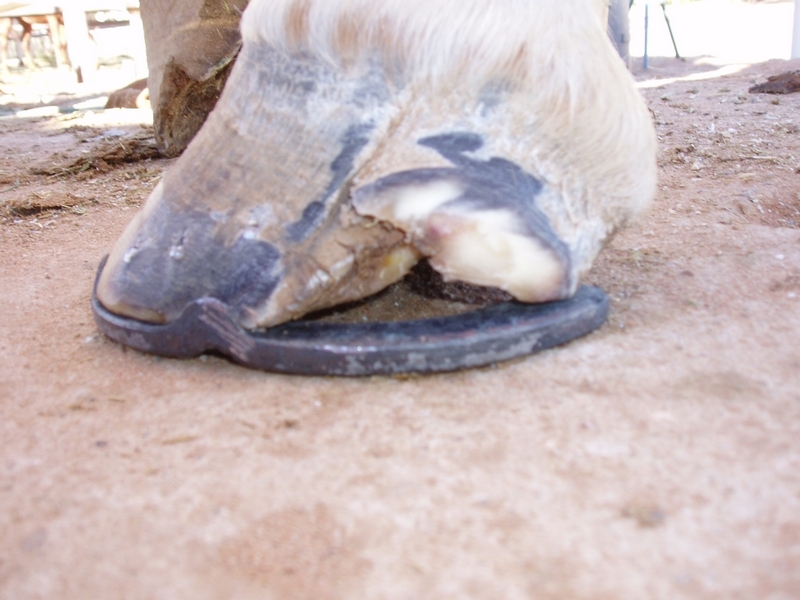 The truly qualified tradesman farrier applying the simple basic principles of hoof balance should not encourage flares in the hoof wall so he should always end up fitting a symmetrical shoe that mirrors the shape of the ideal coronary band. Every alternative method which seeks to change the ground bearing edges of the hoof contrary to the shape of the coronary band profile has a cost to the horse’s mobility sooner or later. 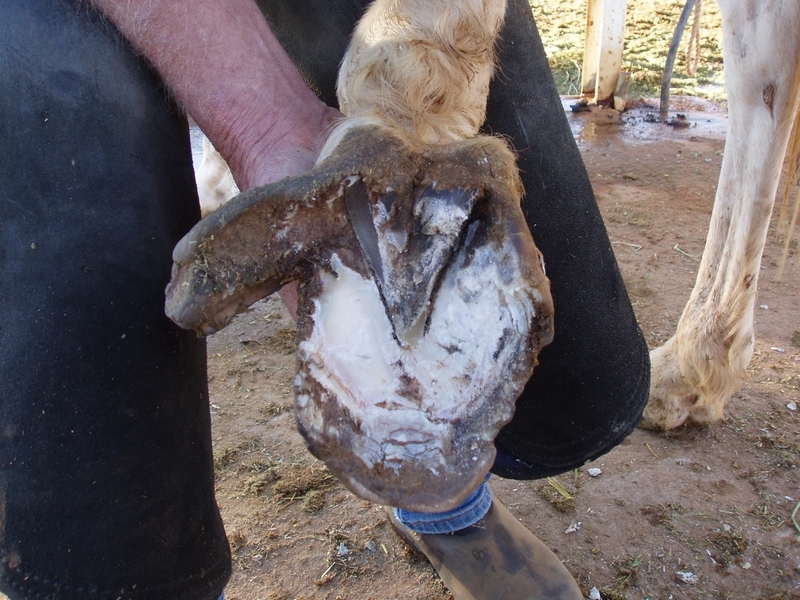 Failure to keep dressing the hoof to its correct shape leads to distortion which causes flaring which causes hoof wall separation which causes abscesses, hoof wall cracks, seedy toe, inflamed laminae and even rotated pedal bones. 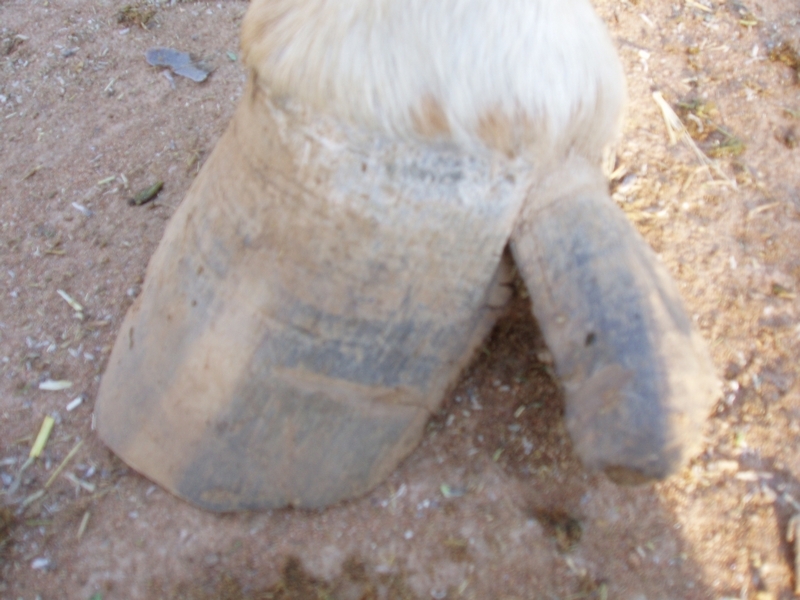 This is why it is so vitally important to dress the hoof properly in the beginning. The good news is that I have yet to find a badly distorted hoof which can’t be improved in the short term or completely restored to normal with a bit of time and understanding. In an extreme example (see Pics 1 & 2) the outside heel had cracked due to a large flare. The heel quarter was removed (Pic 3). The heel flare was taken up as high as possible to reduce all bearing weight off the heel quarter. 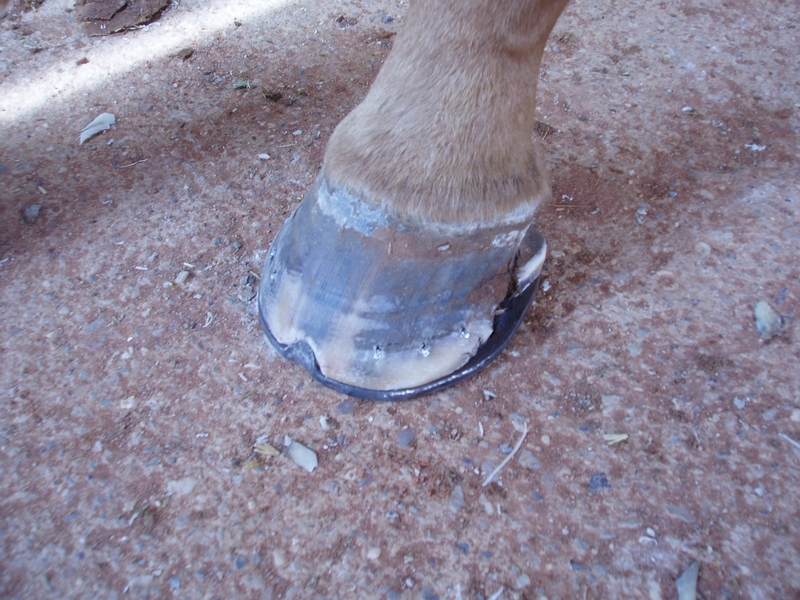 A triple clipped shoe tempered on the affected side only, to stop any distortion and to float over the heel, was fitted onto the balanced hoof (Pics 4 & 5). 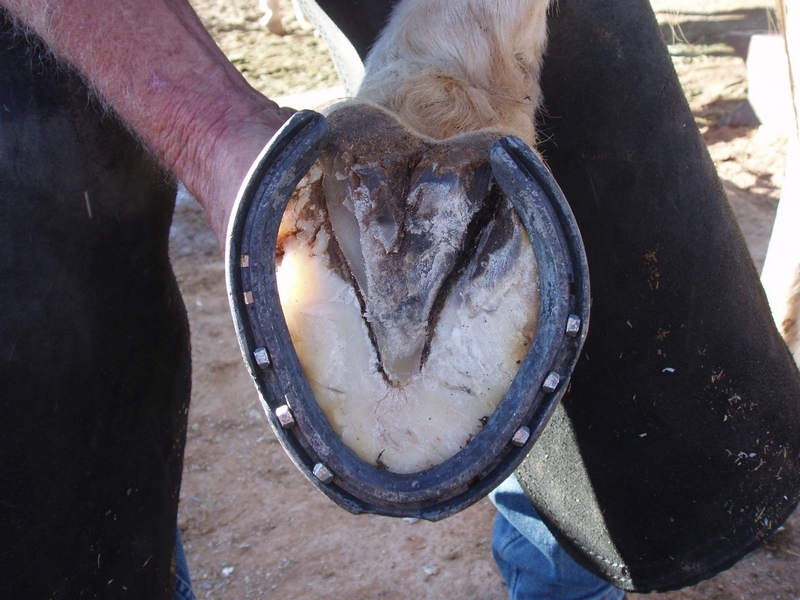 While this was an extreme case, and the shoe did need to be reshaped to fit the distortion, the hoof now has a good chance of ultimately ending up symmetrical and with a symmetrical shoe. The age old saying that prevention is better than cure is certainly true when dressing the hoof for any preparation, whether shod or unshod. Take the time to asses the hoof correctly and don’t allow flares to take hold – ultimately they will let both you and your horse down.